Should the worst happen, you can be assured that your latest backups are recoverable. 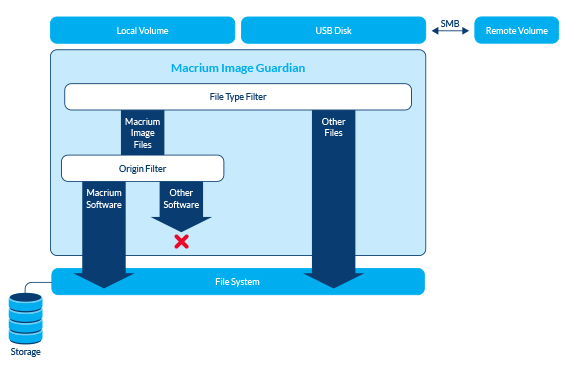 Unlike antivirus software products, MIG is focussed on the single task of protecting Macrium files. It has a small footprint and will not impact the performance of your PC. MIG only grants write access to Macrium Reflect (version 7.1 and later) and any image tools created by us. All other processes will be denied write access. 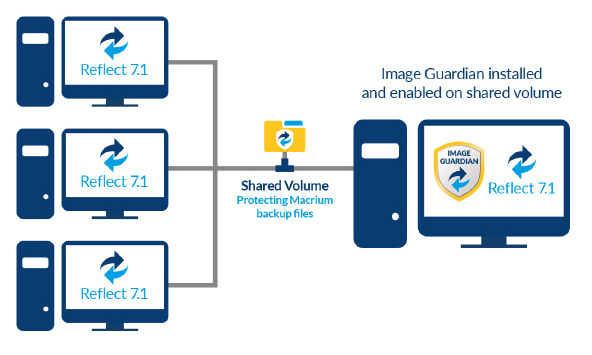 MIG protects local NTFS volumes and allows Macrium Reflect (version 7.1 and later) to use the protected volume as a shared network resource. The other PC's on the network can backup to this shared drive and do not require MIG to be installed. Backup file write access is automatically granted to Macrium Reflect 7.1, and later, all other write access will fail. *Note: SQL backup files can only be created to a protect volume by Macrium Reflect running on the local PC. Network write access will be blocked for all processes, including Macrium Reflect. This limitation will be removed in a future update.